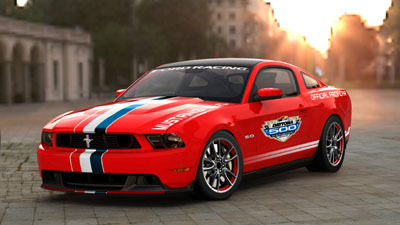 Ford will produce a 2011 Mustang Pace Car Limited Run. Very Limited as a matter of fact. Ford originally reported that the 2011 Ford Mustang Indy 500 Pace Car would be a "one off" car, strictly designed to pace the Indy. Well, that's about to change...sort of. Yes they are going to produce more 2011 Indy Pace Car replicas, but production has been set at 50 cars. No word yet on where these very rare cars will go. So stay tuned! Since the 2011 Ford Mustang Pace Car Limited Run is based on the original pace car, and the car starts life as a 5.0 liter Mustang GT, I expect that the limited run cars will be as well. And that's a good thing, because the 2011 Ford Mustang GT will be equipped with that sweet new aluminum DOHC V8 with a 7,000 rpm redline and 412 horsepower on tap. So if you have a VERY good connection at Ford, now is the time to make that call.